These are the 2016 reviews and testimonials from our clients who have used Curtis Knight Entertainment’s many services. and more to make your event sizzle! Gina and Moose got married ! Curtis, I’ve never done this marriage thing before as a bride so this is all new to me!! PLEASE tell him [ Steve the Video editor ] to take his time. I don’t want to rush him…..45- 90 minutes!!! That’s so exciting!!! Can’t tell you how many times I’ve watched the highlights you sent me. It brings me right back to that night and tears me up. Angelena and Vinny are getting married ! Fabulous! Everyone loved my DJ. He played all the music we wanted and got everyone involved. Everyone said they had so much fun at our wedding! CKE listened to exactly what we wanted for our reception and made it perfect. Fabulous night! Booking was easy. Consultation was super helpful. It was nice to meet and chat with the DJ before the event. Working with Mike was great. He was helpful, respectful of our view/wishes of our reception and totally produced the vibe we were going for. Absolutely he did his best! Everyone told me (unsolicited) what a fun time they had and my DJ was great. So thank you CKE and Mike! Lahey Clinic Department of Neurology Holiday celebration! DJ for Endicott’s Annual Holiday Staff Party !! CKE Team Member (s): Greg Gervais Everything was great! Thank you so much! Book the event ? Easy! Mark Cherone is awesome! We all love him! That’s all I need to say – it sums it all up! A Holiday “Winterfest” Party ! We hired a DJ through CKE for our “Winterfest” event 12/9th. Curtis was very helpful and easy to work with. Greg was the man and he was awesome!! He kept us dancing all night with a great music mix…played a few games and kept us on the dance floor all night with a great mix of songs. He really cared about making it a fun time for all!!! (and did I mention he was very cute). A good time was had by all…everyone loved him. Look forward to having him DJ next year!! A Holiday celebration for Countryside Veterinary Hospital ! Her daughter Noelle’s sweet 16 !! CKE Team Member (s): Mike D Hi Curtis, As always it was a pleasure working with during the booking process. You are always friendly and so helpful and understanding (late payment). The DJ that was sent was good He was good and did a good job. I definitely do feel that he did his best to make the event the best he could. I feel awful…I left quickly because I had to get my other daughter out of there and I felt I didn’t thank him that way I should have. A fundraiser for St Paul’s Soup Kitchen! A surprise 50th Birthday for his wife Julieann Rosmarinofski! Hello, Mark, thank you. When the time comes and we need another DJ for a event I’ll be sure to request you. You did a great job. Happy Thanksgiving. Waltham High School Class of 1966 Reunion! Curtis Knight Entertainment sent a talented DJ, Mark Cherone, to MC and play our favorite music for Waltham High School’s 50th Reunion. It was a tremendous success. We had the reunion at the Embassy Suites Hotel in Waltham, MA and Mark Cherone arrived early, set up and was ready to play on time. He served as our MC and got the crowd up on the dance floor. This is the second time I have used Curtis Knight Entertainment (CKE) and have recommended him several times. If you want a quality experience use CKE. Whether it be a wedding, reunion, party or family event…CKE delivers. Thank you Curtis!!! Kasey and Cory are getting married ! We used CK for our DJ and Mark was so amazing! I had multiple conversations with him leading up to our big day because I wanted a dance party. My family is crazy in the funniest of ways and LOVE to get their dance on. I gave Mark full reigns and told him to keep the dancing going and keep the vibe up. He did just that, from the second the dance floor opened to the last song, the dance floor was packed. My pictures are amazing of people laughing, dancing and just having the best time. I am so happy to have had Mark, he was so flexible, easy going and make everything transition perfectly. It was such a seamless event, I couldn’t have asked for a better DJ! Marysa and Brendon got married ! Thanks Mark, You did a great job and everyone commented on how much they liked you. We will definitely use Curtis Knight again and will recommend your company to others! Photo Booth for Gia’s wedding ! Sarah and Sean are getting married ! CKE Team Member (s): Curtis and Anna ! Curtis Knight Anna Shelbaer Curtis Knight Curtis Knight Kim Vara Curtis, it was very easy getting to your office. Booking my event was simple. You gave us examples of what you did for other pictures. You were very entertaining every time I saw you face to face. Curtis working with you on the whole event and during the event was really fun. You kept me excited about everything. My whole event was wonderful. The ceremony was quick and painless. During the reception the music playing was wonderful. You kept my guests entertained the whole time. Thank you again so much Curtis and Anna. Thank you to Kim as well, she did wonderful putting up with my nieces and nephews at the photo booth. 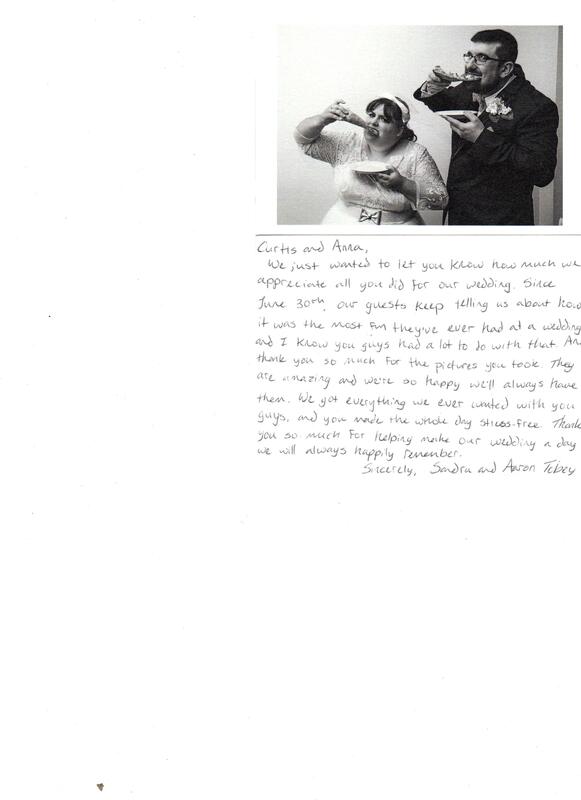 Curtis Knight Entertainment was a wonderful addition to my very special wedding day!! Sean and I couldn’t have been more happier with our day! Curtis and Anna together were amazing!! They played all the music we wanted and requested! They knew how to keep the reception fun. I had them as my JP/Photographer/DJ. All in all everything about my wedding day was amazing!! I highly recommend this DUO!! Kim Vara was in charge of the photo booth we had and she was fantastic!! Curtis Knight Entertainment again is a MUST HAVE for any occasion!! Mike and Michelle’s thank you got lost in the mail and arrived 10-17-16. Their wedding was 10-11-14! 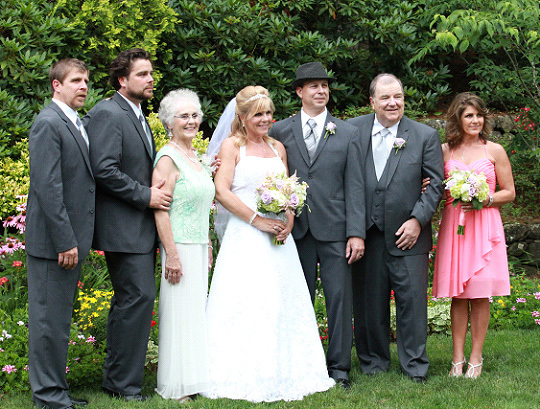 Mike and Michelle’s wedding – Group Photo ! Everyone loved the photo booth! You all did such a great job. I can’t stop looking at the book! Joe and Sam got married ! CKE Team Member (s): Curtis and Anna ! I can not thank you guys enough! You were absolutley amazing! From taking pictures and putting them on the tv! My guests keep talking about hat added touch! To making the night so memorable and fun and getting everyone up dancing! I couldnt have asked for better Entertainment! I appreciate you guys for taking the time and really making this such a memorable night for joe and me! I will be spreading the word that if you want a great wedding you need to go to CKE! Robert and Kathy got married ! THANK YOU!!!!!!!!!! We had a great time and thanks to you my friend………😊 we all had a great time my colleagues and friends are still talking about the whole evening especially the dancing you made them alll sooo happy and everyone did not want to stop dancing ….thanks to you!!!!! Our celebration went by sooooooooo fast!!! We are sooooooo happy and I am so happy how everything went. Thanks again for your professionalism,expertise and your attention to detail it showed throughout the night! We loved our last dance especially when just the staff,two dear couples and you were on looking.I loved that!!! I felt through out the whole day it was just the both of u🤗s we truly were in a blissful state of happiness and love. YOU can’t get any better than that!!!! God Bless you and your family and thanks million for your help!! Brandon and Tina got married ! Hi Bob, Thank you so much for performing our ceremony. It was beautiful, and exactly what we wanted. You made our wedding night a memorable one that will stay with us for years to come. Victoria and Jon are getting married ! 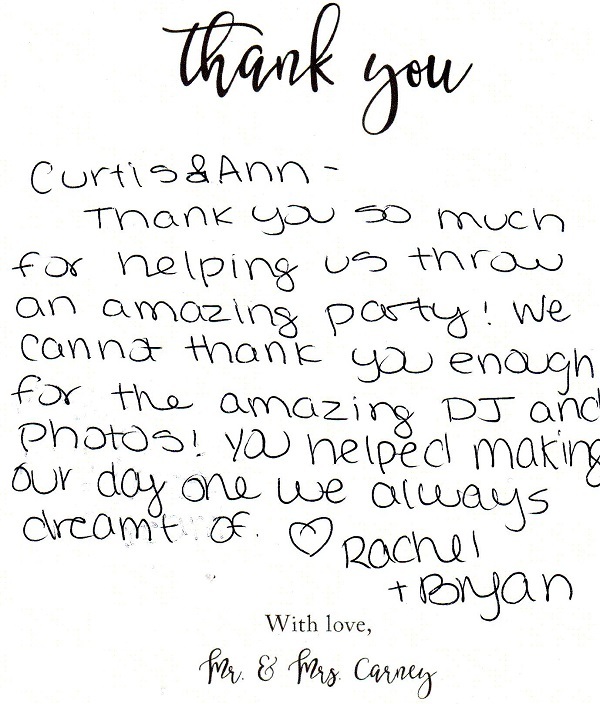 Dear Rachael, This comes a little late but, we wanted to thank you for taking such great pictures during our wedding. We are so happy with them and couldn’t ask for better ones. Thanks again for the wonderful photos of our special day. All the best. Rachel and Bryan got married ! Hi Curtis & Anna! Thank You SO MUCH for an amazing evening of entertainment !! So many compliments from our guests / The dance floor was NEVER empty actually Always Packed !! You guys were Great !! Sandra Pelletier & Aaron Tobey are getting married ! Tina and Chris are having a luau to celebrate their recent marriage! Zach and Emma got married ! Curtis and Anna, Zachary and I cannot thank you enough for making our wedding truly unforgettable and so much fun. All your time and effort truly shown through and made the wedding better than we could have ever imagined. I knew you guys would be awesome and I am still just blown away. It was the best night of our lives and we wanted to thank you for being a part of it and making it unforgettable. Ari and JJ are getting married ! Hi Curtis, Our experience was Great– easy, transparent, much appreciated. Everyone did the best they could to accommodate our needs. Our (8 minute!) hora was a huge success so thanks so much for your support there! Our friends were on the dance floor the entire night– thanks Mark! DJ was great and accommodating. We basically just winged it with events and he was able to be flexible and just go with the flow. Thanks again! A triennial reunion for The American Community School “ACS” of Beirut! An 85th surprise birthday Party for Kim’s Mom, Ellen Burke ! Booking with CKE was so easy!. The planner on the website is user friendly, and any questions I had the response time was really fast. If you have an event your best choice would be to use CKE! CKE team are always professional, courteous, listen to your requests, and know what is needed for a perfect event! The MC’S know exactly what to do to get the crowd moving and the photographer captures the perfect special memories! CKE made our mothers 85th bday party one that will never be forgotten. All of her family is raving on how they loved the music, lights, dancing and fun. The night flew by and was amazing! Very easy and convenient. Quick responses with many time and date slots available for meetings. Fantastic! Pleasure to work with, very accommodating, kind, helpful and professional. All did a phenomenal job! Made the day run smoothly with much fun and professionalism. All areas would be highly recommended to any looking to book. Fantastic group that made my family and friends feel like theirs. Thank you!!!!!! Hi Curtis, Working with the office staff was easy and you provided excellent customer service. Working with Rene was an honor and a pleasure, he showed up on-time, ready to perform and provided our guests with plenty of individual time to talk, take pictures etc…Rene was phenomenal and easily the biggest hit at the event! Karaoke and DJ for Jarred’s grad party ! CKE is thorough when they help organize an event. We needed a DJ for our son’s high school graduation party and Curtis and his team were prompt in response to our inquiry as well we helpful in reminding us of our deadlines as the event approached. Mark showed up on time with a smile and a hand shake, with his cool curly hair and positive attitude. He advised on how to keep the best value of his DJ services by placing him right in the mix at the party. It was a great idea! Mark was easy going, understanding when we had a major glitch with the catering, and helpful when we needed timely announcements made for our guests. We loved him and hope to work with him again for our next children’s graduation parties! We wanted to place him on an open deck apart from the group and he explained how folks would not even know he was there. We’d not thought of that! He kept the music level high enough for the entire group to hear, no matter where they were on the property but at a level that still allowed for everyone to talk and enjoy conversation. Thank you for making this day great! We had a number of folks who thought having a DJ at the party was a really nice touch. Jarred was grateful too! Jessica and Nick got married ! From the Knot 8-5-16: Curtis & Anna were DJs at our wedding. We also used their services for videography and photobooth. Everything went great! Everyone was on the dance floor for the whole night. Our guests were constantly using the photo booth to take funny pictures. We received a book with a copy of everyone’s photo booth pictures at the end of the night. The videographer was able to capture all the moments of our day without being invasive. Curtis Knight Entertainment made our wedding day fun and exciting. 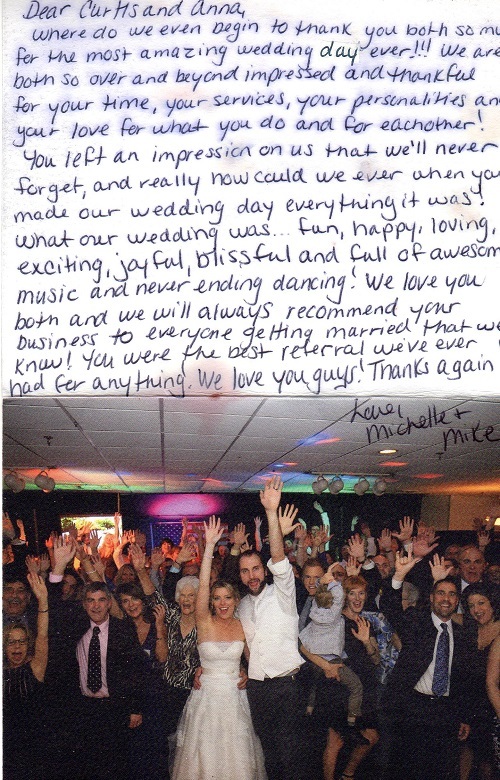 We would recommend them to anyone who is looking to have a fun time and get the party started at their wedding. Kathryn and Mark got married ! We got referred to Curtis Knight Entertainment from my husband’s cousin who used a DJ through Curtis and he did an amazing job! We wanted to use the same DJ and we booked him right away, but a few months before our wedding, he decided to stop DJing. I was very disappointed, but Curtis wasted no time in getting us a new DJ. He set us up with DJ Rolling Rick and I honestly couldn’t of been more pleased with how energetic he is! He had no problems with last minute decisions (even one during the reception!) and he went with the flow while also sticking to the schedule we had chosen. Rolling Rick made all of our announcements and then some!! He was very comfortable with my crazy group and did such an excellent job! He also danced all night behind the DJ booth which we loved!!! We also got a photo booth through Curtis Knight Entertainment & it was such a hit! My husband was on the fence about getting one, but I knew it was a must! All of our guests thoroughly enjoyed it and we got numerous compliments. The photo booth is like a little room with curtains on all sides (it fits a lot of people!) so the photo booth attendant is the one actually taking the pictures. I was relived that I wouldn’t be getting any naughty photos! The photo booth has a lot of props and our attendant we got assigned was Eamon and he was a blast! He also kept the area very organized and clean. He also held onto my photo strips until the end of the night so I wouldn’t have to keep track of them! We got a book of all the strips at the end of the night and there was a screen with a slideshow of the pictures so you could see them every time you walked by. The last part of my review is of Curtis. He was very helpful as I mostly dealt with him and he emailed back very promptly. He made sure I was taken care of and pleased with everything. He also did an amazing job editing my Father Daughter song since my dad didn’t want to dance a whole song!! I was very pleased with all of the services we used! A surprise 40th Birthday for her brother Fred/ ( or Freddie ) ! Merry and Mark are getting married ! Kathryn and Mark are getting married ! We got referred to Curtis Knight Entertainment from my husbands cousin who used a DJ through Curtis and he did an amazing job! We wanted to use the same DJ and we booked him right away, but a few months before our wedding, he decided to stop DJing. I was very disappointed, but Curtis wasted no time in getting us a new DJ. He set us up with DJ Rolling Rick and I honestly couldn’t of been more pleased with how energetic he is! He had no problems with last minute decisions (even one during the reception!) and he went with the flow while also sticking to the schedule we had chosen. Rolling Rick made all of our announcements and then some!! He was very comfortable with my crazy group and did such an excellent job! He also danced all night behind the DJ booth which we loved!!! We also got a photo booth through Curtis Knight Entertainment & it was such a hit! My husband was on the fence about getting one, but I knew it was a must! All of our guests thoroughly enjoyed it and we got numerous compliments. The photo booth is like a little room with curtains on all sides (it fits a lot of people!) so the photo booth attendant is the one actually taking the pictures. I was relived that I wouldn’t be getting any naughty photos! The photo booth has a lot of props and our attendant we got assigned was Eamon and he was a blast! He also kept the area very organized and clean. He also held onto my photo strips until the end of the night so I wouldn’t have to keep track of them! We got a book of all the strips at the end of the night and there was a screen with a slideshow of the pictures so you could see them every time you walked by. The last part of my review is of Curtis. He was very helpful as I mostly dealt with him and he emailed back very promptly. He made sure I was taken care of and pleased with everything. He also did an amazing job editing my Father Daughter song since my dad didn’t want to dance a whole song!! I was very pleased with all of the services we used! Again another great event! The kids danced the whole night. Definitely my go to for any upcoming events!!! Interstate Operations Center Open House/ 50th Anniversary! Michael + Tara Highlight Wedding Highlights from Curtis Knight on Vimeo. School to Work, COAP and SCOAP =our graduations as one ceremony!! a 3 person birthday for Dewey, Hank, and Bobby ! Hi Curtis, Just wanted to let you know Mark Cherone was fabulous last night, and such a nice guy. Funniest musical chairs I have ever seen. Even funnier I think I went to school with him! I was wondering all night and kicking myself for not asking him…but I’m almost positive. Kate and John got married ! I just wanted to say thank you so much! Our wedding was a huge success. Mark you were amazing and great at what you do! It was such a fun night! A a high school graduation party for her twins Alison and Billy.! Working with your office to book my party was easy! And Rich was great! Thanks again! A sweet 16 celebration for the one and only Marianna Miller! DJ for Shriver Job Corp 2016 Prom! The office staff is always responsive, quick and attentive. Mark shines again!!!! Absolutely amazing job, I’m so glad to have the opportunity to work with him again. He never disappoints. Students and staff were WELL entertained. Employees like Mark will keep you in business for life. Dress, demeanor and attentiveness A++++. Will hire again!!!!! If you ever need a reference, don’t hesitate to ask!!!!! Thank you again. Our experience on three levels was great! Mark was wonderful to work with, as were you! Thank you so much for your support and generosity. Best, Kayla Kayla Hindle | Community Manager, Relay For Life New England Division | American Cancer Society, Inc.
Lisa and Jamie are getting married ! Flawless. Awesome. Greg was wonderful, as usual. The trivia was a lot of fun. He definitely got people up and involved. Can’t wait until next year’s event! Thank you!!!! Lee and Matthew got married ! Curtis is a DJ, photographer, and Justice of the Peace, and now realtor. Curtis and Anna gave our special day that special something that made our wedding so much fun. Curtis was at our beck and call whenever we wanted to capture a moment of cuteness with children. He was very vibrant, flexible, and made everyone laugh. I’m excited to see some legitimate smiles in the photos when we get them. Throughout the ups and downs of the planning process, he was amazing at making us feel at ease and guiding us to make decisions that suited our needs and preferences. It seems expensive, but dealing with one person to do the role of three, makes life MUCH easier. A Bar Mitzvah for the one and only Kobe Richards! Such a pleasure! Will happily pass your name on with my compliments to folks at the temple too…several kids said, “It’s the best party I’ve ever been to!” Be well! A surprise 50th Birthday for his wife ! Carol and John are getting married ! CKE Team Members: Curtis Knight: JP, Curtis Knight: Photographer, Anna Shelbaer, Photographer. U both did an absolute wonderful job..didn’t expect those large pictures was so surprised . Curtis Knight Entertainment was a pleasure to work with from our first phone call to inquire about their services, to planning the event, payment, and the night of our event! Curtis and Anna went above and beyond to make sure all of our needs were met, we were happy and most important that everyone had FUN! The photos that Curtis took the night of our event were greatly appreciated and an unexpected surprise! The pictures show what a great time everyone had! THANK YOU! CKE did an amazing job! The photos are stunning! Anna and Curtis are a blast! Everyone said it was one of the best weddings they’ve been too! I highly recommend CKE for DJs, Photos, videos and photo booths! I wouldn’t have changed a thing! ( Mother of the Bride: ) Hi Curtis! Sorry it has taken so long but I wanted to say THANK YOU for the fabulous job you did for Jenn’s wedding ! There is not one thing I would have changed. You were great at calming nerves and keeping the smiles coming before the ceremony. Your patience with the flower girls was something not a lot of people could do. The ceremony was beautiful and you made the reception a night to remember ! There is not one thing I would have changed. Somehow despite all the formal pictures and festivities, you managed to get a picture of everyone that was there. We are still getting compliments two weeks after the wedding ! A Holiday celebration for the amazing Gemline ! I absolutely LOVED working with your office. It was easy, quick, and efficient. You were able to provide everything we were looking for (even at the last hour!). We appreciate your help with everything. 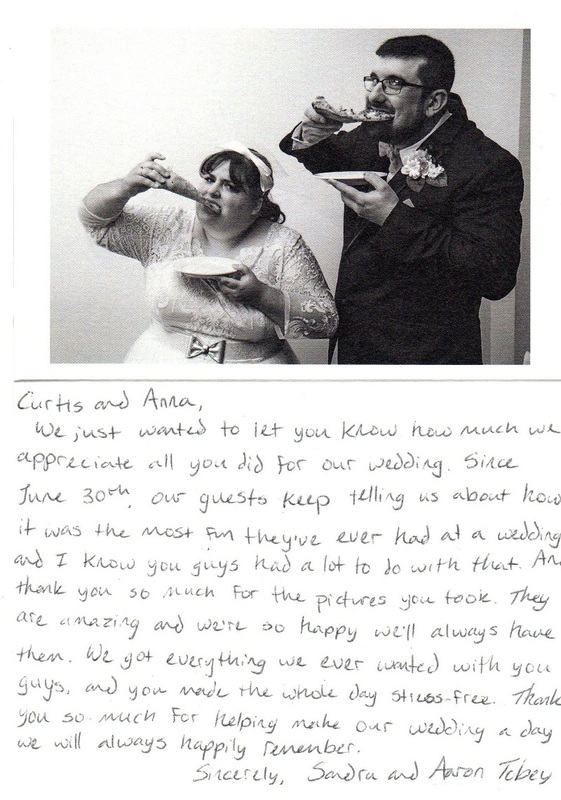 The experience was great – Curtis and Anna were upbeat, encouraged associates to have fun, and it was an awesome time. I believe Curtis and Anna were on top of their game. Curtis and Anna were awesome!! CKE Team Member (s): Curtis Knight, Anna Shelbaer, Rich Padula / photo Booth, Game Show, Karaoke, DJ, MC Photography. Thank you, Curtis! We all had a great time. Great job! Everything was great last night! Mark was very friendly and had a great attitude. I was worried that people would not be out there dancing but Mark got them out there and kept them out there! I was very impressed. Looking forward to working with him again. I will definitely recommend him to friends! Booking was also very easy. The whole experience was perfect! Thank you so much!